Brrrrr! A cold and snowy morning in Denver! The first day back from vacation! A perfect day for a new read aloud! Yeti is a school bus driver. Students who get on his bus go past all sorts of fun places and end up at a cold and snowy mountain destination. A super simple picture book that kids are going to ask for over and over again! For years, though, the most important Christmas presents that I bought were the books I wrapped and put under the tree for my nephew, Gregory, and niece, Megan. I always knew that my presents would not be the favorites on Christmas morning, but I also know that at some point, later that day, or Christmas night, or maybe the day after Christmas, we would have a snuggle session, in which the books I had chosen figured prominently. My niece and nephew are all grown now. I'm sad, because I know exactly what book I would give my nephew. I'M COOL, Kate and Jim McMullan's latest offering, features one of my nephew's favorite machines- a Zamboni (the machine that smoothes the ice rink). The story opens with a sports announcer, but is quickly taken over by the "blade-packing, ice-shaving, snow-eating, water-spraying, slush-slurping, towel-dragging, triple-tank truck." Definitely a book to put in your basket as you are shopping this year! Welcome to the Poetry Friday Roundup in cold and snowy Denver! I'm writing this about 4:00 on Thanksgiving afternoon. Most years, we head sixty miles south to spend the day with my family, but my son started a new job about a month ago, and he had to work from 11-7, so we are having a quiet day at home. We'll have dinner about 7:30. I'm a CYBILS first round poetry judge, so I've been reading a lot of poetry for the past few weeks. I found my poem for today in National Geographic's Book of Nature Poetry, edited by J. Patrick Lewis. 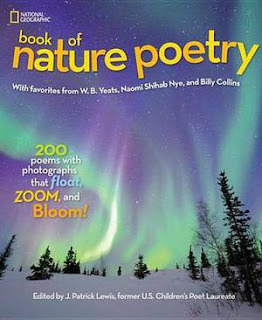 The book features "more than 200 poems with photographs that float, zoom, and bloom!" and includes many, many poets you will recognize from Poetry Friday. The poems are grouped roughly by subjects- topics like Sky, Sea, Land, Seasons, Distress and Splendor.It would be a perfect seasonal gift for any child or adult who loves nature, poetry, or photography. with seeds in their cheeks. the fire to keep warm. It's a good thing this was a pretty slow Poetry Friday, because it ended up being a crazy day on the home front. I hate shopping, but my sons were convinced we could get great deals on technology stuff if we ventured out to Black Friday, so we did. First I went with Son #1. Then I went with Son #2, who forgot something critical, so we had to go twice. And then Son #1's purchase didn't work and had to be returned. Yikes! · For a different take on November, check out Elizabeth Coatworth’s poem at Miss Rumphius’ Effect. Tricia gives us all a huge present with ideas for six different websites that deliver daily poems to your inbox! Poetry every day! Woo Hoo! · Donna Smith’s “Coyote Moon” captures the music of the night, in a reverso no less! And her notes on her writing process made me laugh! I can’t tell you how many perfect poems I have “written” while walking the dog, but have never actually gotten down on paper. We’re looking forward to your turkey poem, Donna! · CB Hanek celebrates the beauty of fall found out her back door, in a poem she has submitted to Carol Varsalona’s Autumn collection. · Speakers at NCTE inspired Julieanne Harmatz to push out of her comfort zone and try her hand at poetry. In “A Brief Visit” she celebrates the delight of an early morning rain. Carol Varsalona was fortunate enough to hear one of my all time favorite poets, Marilyn Singer, at NCTE. This inspired two moon poems. · Violet Nesdoly lives in Saskatchewan, where they celebrated Thanksgiving about six weeks ago. Her original poem, “Thanksgiving Lunch at the Mennonite Church,” makes my mouth water. I want pie! · The very talented Robyn Hood Black not only found a poem in an 1880’s business forms book, she created art from it! And it’s about writing! · It’s the final week for Matt Forest Esenwine’s Poetry Cubed Contest and today he’s featuring entries by Julie Larios, Karen Eastlund, and Jessica Bigi. If you haven’t entered yet, you need to get busy because the contest ends on Monday. · And speaking of challenges (actually not sure they should be called challenges, maybe invitations is a better word), Michelle, at Today’s Little Ditty, invites us to submit a poem about kindness. There are already almost twenty original poems and another 15 or more published poems. This one also closes on November 30th. · Linda Baie’s poem about the kindness she experienced during her husband’s illness is published on Michelle’s page, but you can also read it on Linda’s blog, Teacher Dance. Having experienced many of these same kindnesses during my mom’s recent illnesses, I think it’s a perfect for this Thanksgiving weekend. · Mary Lee’s been away for a couple of weeks. Today she is back with an original haiku about the carousel in her hometown of Burlington, Colorado. · Dianne Mayr is creating a sketchbook project that focuses on angels. Today’s poem, “The Better Angels of Our Nature” was actually written in 2009, for the inauguration. 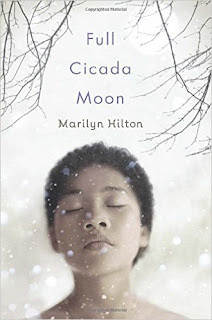 · After reading Ramona’s review, I can’t wait to get hold of ONE TODAY, the poem Richard Blanco delivered on the National Mall for Barack Obama's inauguration for second term as president of the United States. I was surprised to learn that the book was illustrated by Dav Pilkey, of CAPTAIN UNDERPANTS fame. · I can always count on Tabatha Yeatts to offer something interesting. Today it’s Derek Walcott’s “Love After Love,” performed by Tom Hiddleston. Don’t miss this feast for the soul! · Along similar lines, Little Willow shares Sara Bareilles’ song, “Beautiful Girl.” Be sure to scroll all the way to the bottom of the post to listen to the song. · From down under, Aussie Contributor Sally Murphy shares a favorite poem, My Country by Dorothea Mackellar. She tells us this poem is often parodied in Australia, and shares one of her favorites. · Heidi Mordhorst talks turkey about her experience last week at NCTE. She shares a number of links that I definitely want to check out! I love poetry. I love historical fiction. I love books with strong female characters. FULL CICADA MOON fits all three of those qualities. The novel in verse begins in January, 1969. The Vietnam War is drawing to a close. Space exploration is moving full speed ahead, with the Neil Armstrong's walk on the moon looming on the horizon. Twelve-year-old Mimi and her mother are on a bus, traveling from California to join Mimi's father, who has taken a job as a professor at a college in Vermont. This might be like any coming of age novel except for one thing. Mimi's mother is Japanese and her father is black. Many people in Vermont are not especially welcoming of Mimi or of her family. Her next door neighbor refuses to talk to Mimi and her family, or lend them a snow blower. The kids at school engage in small, daily acts of unkindness. A classmate steals a critical piece of her Science Fair project. A store clerk accuses her of shoplifting. Mimi is even more of an outcast because she pushes against the gender stereotypes of that era. She already knows how to cook and sew and would much rather take shop class than home economics, but the middle school principal won't allow that. She loves science and dreams of being an astronaut, but that's not a career that is considered acceptable for young women. A terrific story with a strong young woman and a couple of very special friends. 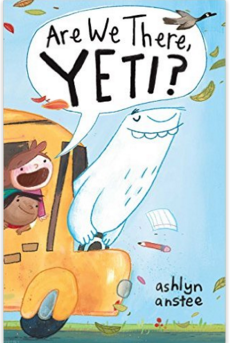 I checked this out of the library, but I'm going to have to buy it, because I know it's a book my middle school friends are going to love. I've been a teacher a long, long time. The first few years I taught, I was sometimes a little surprised (ok, sometimes shocked) by the stories my students would tell me. And I was also a little surprised by the stories they went home and told their parents. It wasn't too long before I began using that standard line, "I won't believe everything your kids tell me at school, if you don't believe everything they tell you at home." I've gotten a lot of mileage out of the line over the years. This week was one of those times. Atticus is a first grader at my school. Several weeks ago, he came to school and told his class that Uncle Ben's Rice was having a "Beginner Cooking Contest" and he had entered his specialty, Atticus' Hawaiian Rice. He and his mom had made a video and sent it in. If they were one of the top five contestants, our hundred year old school was going to win a $30,000 cafeteria makeover. Atticus wanted his classmates to see his video. And so they did. I know they did because my office is between the two first grade classrooms and I walked in just as they were finishing. "Dr Carol," exclaimed Atticus. "You missed my video!" He was more than a little sad. "Maybe we could watch it again?" suggested one of his classmates. His teacher, Kathy, said that the video was only a couple of minutes long. If I had time, we could, in fact, watch the video. I did have a few minutes, and so we watched the video again. Later on, she showed the video to first graders in the other class, because our classes spend part of their day in mixed language classes and most of them also know Atticus. And then there was more big news. "Guess what, Dr. Carol??" said O, as I walked into the room. "Your brother was born?" I guessed, knowing that O's mom is due to have a baby any day. "No!" Emmanuel shouted. I was a little surprised at the crowd that was gathering, given that I make numerous trips throughout the classroom every day, and we have trained the kids to simply smile and wave. I guessed again. "There's a new Mo Willems book?" By this time the entire class had pretty much stopped and Kathy had joined the crowd. "Atticus, do you want to tell Dr. Carol your big news???" Atticus leapt into the air. "I made the semi-finals," he shouts. "My recipe made it to the semi-finals!" His leap was so cute that Kathy made him do his leap again while she videotaped it, so she could show it to his mom. His classmates were ecstatic and we had to open up the web page of semi-finalists and watch the video all over again. Several children told me their families had made the recipe. Others say they are going to try it soon. Over the last ten days, the excitement about Atticus' Hawaiian Rice has spread throughout the school. It's been on our school Facebook page. Fliers have gone home in our last two Thursday folders, reminding people to vote. Our middle schoolers have taken up the cause, logging onto every single computer on the second floor and voting for Atticus every day. It's become kind of a school cause. About a week ago, we learned that Atticus and his recipe were going to be on GOOD MORNING COLORADO on Monday morning. Once again, the first graders were thrilled. We are out of school this week, but Kathy sent home a flyer on bright turquoise paper, reminding people to watch the show and vote for Atticus. I put the flyer on my refrigerator, so I would remember to watch. On Monday morning, Atticus was on television. He was as cute as could be, all dressed up in a dress shirt and bowtie, and did a great job walking the show's hostess through his recipe. There was, however, one really funny glitch. At one point, the hostess remarked that it was so great that Atticus was in the contest, and she hoped he would win the cafeteria for his school. "Do you think any of your classmates know that you are in this contest?" the hostess queried. Atticus had to think for a minute. "Ummm, I'm not too sure. We haven't really talked about it that much." I almost fell onto the floor. 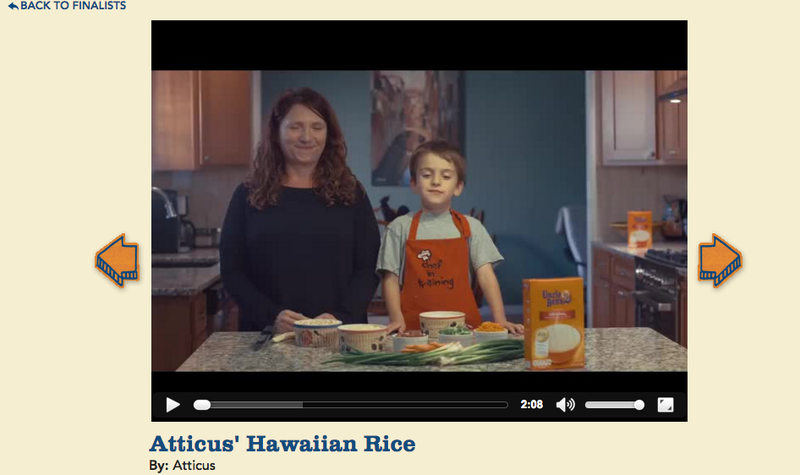 Atticus and his Hawaiian Rice are ALL we have talked about for the last few weeks. I couldn't wait to talk Kathy. "He was probably nervous," she said. "Maybe he just forgot how much we have talked about it." I can't wait to get back to school to talk to Atticus and ask him about it. 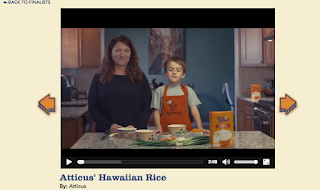 In the meantime, maybe some of you could vote for Atticus' Hawaiian Rice. You can vote here once a day for the next five days. You can watch Atticus on GOOD DAY COLORADO here. It's really important that we ramp up some extra support because no one in our school knows about the contest! I will be spending a good part of my Thanksgiving break reading poetry for the CYBILS. This morning I started with WINTER BEES AND OTHER POEMS OF THE COLD by one of my favorite poet-scientists Joyce Sidman. I have been using this book with students and teachers for about a year, I'm actually not sure why I have not yet reviewed it. WINTER BEES is a celebration of nature in winter. Animal poems include the tundra swan, snakes, the moose, winter bees, the raven and wolf (did you know they actually work together to hunt?) the vole, the chickadee, and a very weird bug called a springtail or snow flea. Other poems celebrate snowflakes, trees, and skunk cabbage. Each poem is accompanied by a super interesting informational piece. Did you know for instance, that honeybees are one of the few insects in the Northern Hemisphere that remain active in the winter? To bend when the wild winds blow. Roots are deep and time is slow. All we grasp we must let go. Buds can weather ice and snow. Dark gives way to sunlight's glow. Strength and stillness help us grow. The book is illustrated by Minnesota printmaker, Rick Allen, who claims to have lots of experience observing winter. Allen used linoleum blocks (nearly two hundred of them, according to the front of the book). Allen digitally scanned the prints and layered them to create the illustrations in the book. The book also includes a glossary, an unusual touch in a poetry book. 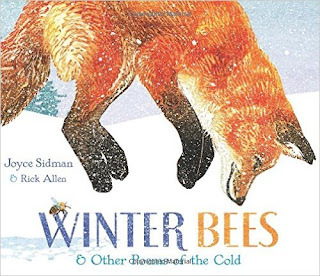 I can definitely see using WINTER BEES as a mentor text for young researchers and poets. This used to be one of my favorite weeks of the year. Usually, I would get on a plane on Thursday night. The last few years I went, it was Thanksgiving dinner day at my school and I had usually done lunch duty for 5 hours straight. I was totally exhausted. But I was going to NCTE. Most years, I roomed with my friend Cyrene. We had gone to graduate school together at UNH. After grad school, she moved to northern Maine and I moved home to Colorado. NCTE was the one time a year we got to see each other and all of our other UNH friends. There would be rich conversations, sharing of books, a little wine and lots of laughter. I loved it. And I loved the sessions. Three days of Speaker Nirvana. Don Graves. Ralph Fletcher. Tom Newkirk. Linda Rief. Shelley Harwayne. Author after author after author. A time for drinking deeply from the well of professional knowledge. I loved the Exhibit Hall. Wandering through row after row after row of publisher. Children's books. Poetry. Professional books. I loved it. I haven't gone to NCTE for a number of years. One of the first years after I adopted the boys, I commented to one of them that I was going, but would be back really, really soon. And Isaiah, my older son, replied, "It seems really, really soon to the person going, but to the person staying, it's a really long time." And I felt horrible that my boys, who had been without a family for so long were feeling so alone. So I stopped going away overnight. And then they got older and went away, but I was a single mom paying tuition and conventions were a luxury. So I haven't gone. For a really long time. But I really miss it. I am a literacy coach at a dual language school. I speak some Spanish, and I work on my Spanish pretty much every single day, but I am not bilingual. It's really, really, really hard to learn a new language. As a literacy coach, I am responsible for supporting English and Spanish teachers. Over the past few years, I have found it much harder to support the Spanish teachers, not only because of my lack of fluency, but also because of the lack of resources. There simply aren't as many great books published in Spanish as there are in English. I'm always delighted, then, when I come across a new title. 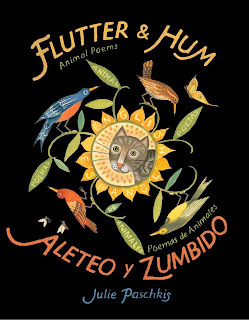 This week, in my reading of CYBILS nominees, I came across a terrific new bilingual poetry book. 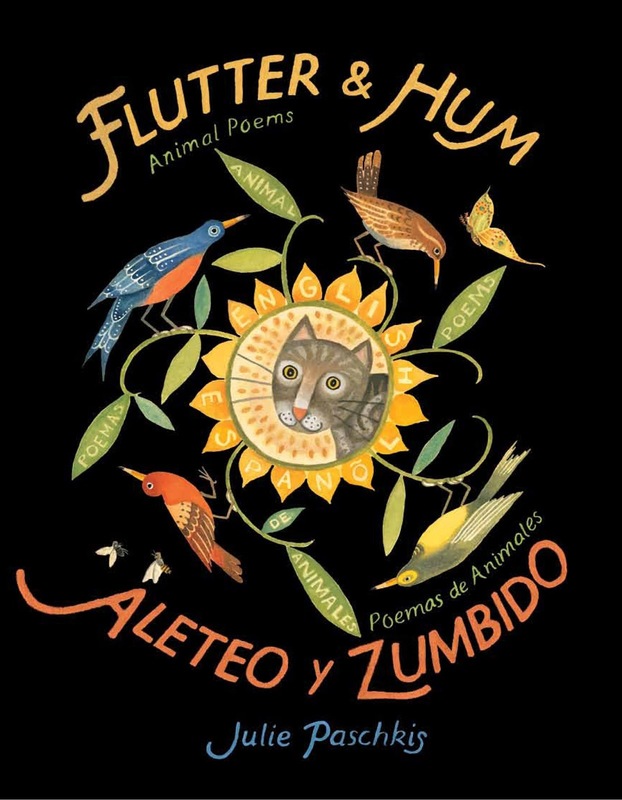 FLUTTER AND HUM: ALETEO Y ZUMBIDO by Julie Paschkis, is a collection of fifteen animal poems- snake, turtle, crow, heron, parrot, dog, cat, cow, fly, whale, deer, moth, owl, fish-- in English and in Spanish. Each poem is a two-page spread, English on the left and Spanish on the right. Each poem is accompanied by Julie Paschkis' gorgeous folk art, with words/palabras embedded in the illustrations. One of my favorite poems from the book was the lead poem, "Snake." As much as I loved the poems in this book, I loved the author's note in the back In this note, Julie says that she is not a native Spanish speaker, and has, in fact, only been speaking Spanish for about ten years. She became interested in the language when she was illustrating a book about Pablo Neruda. Paschkis says, "Somehow my unfamiliarity with Spanish freed me to write poetry. I felt like a visitor wandering through a forest of Spanish words, marveling at the beauty of sound, meaning, and syntax." As someone who struggles every single day to understand and communicate in a language that is not my own, I am blown away by this comment. I can't imagine myself ever having enough facility to write poetry in Spanish. Wow. 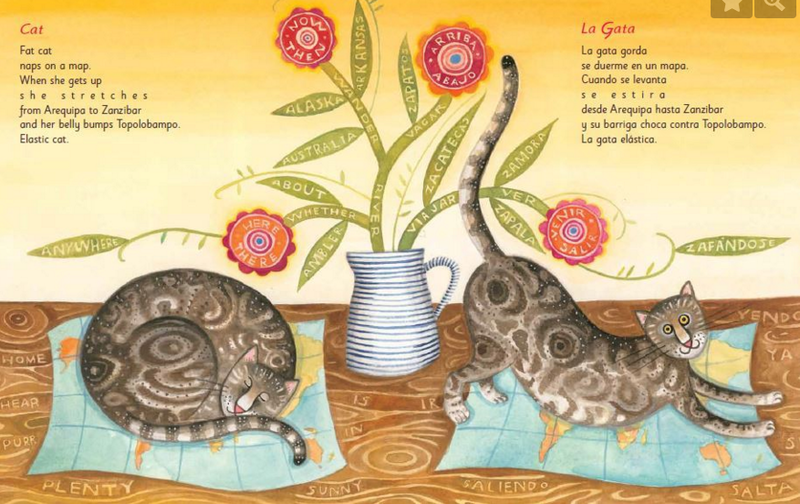 Read Julie Paschkis' explanation of how she is learning Spanish and how she writes poems in Spanish here. Read Jama Rattigan's review and interview with Julie Paschkis here. Read the Kirkus review here. 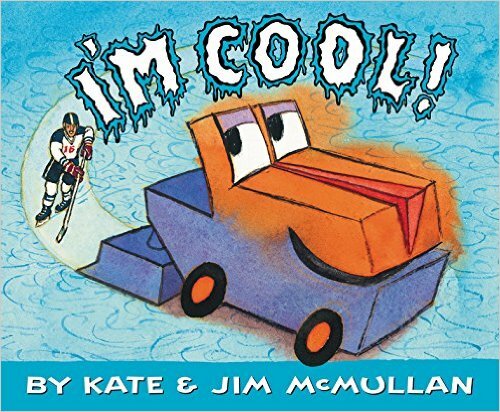 I'm taking this book to school today for Poetry Friday! Bridget, at Wee Words for Wee Ones, is hosting Poetry Friday today. I work at a terrific school. A great place where kids are known and honored for their talents. We have art and music and PE. We have caring mental health specialists who help us take care of kids' hearts and families needs. But we don't have a librarian. Our library is staffed by a para and a group of volunteer parents. There's no one who can say, "You liked ** (RAIN REIGN, PERCY JACKSON, books about snakes), so you'll love this one. Kids can't get a book any time they need/want to. Teachers can't find what the special books they need. Schools who want to grow readers need a librarian. 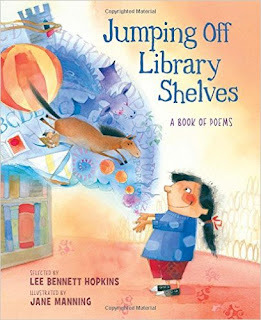 Maybe that's why I loved Lee Bennett Hopkin's newest book, JUMPING OFF LIBRARY SHELVES. Fifteen poems that celebrate libraries and books and words. Some of the finest children's poets- Amy Ludwig Vanderwater, J. Patrick Lewis, Jane Yolen, Nikki Grimes, Joan Bransfield Graham, Kristine O'Connell George, Rebecca Kai Dotlich-- and lots of others. Beautiful watercolor illustrations. A CYBILS nominee. Read more great poetry at Write. Sketch. Repeat. I've had a crazy start to the school year and have been a pretty absent blogger, but I've started reading for the CYBILS and am going to try to get back to blogging more frequently. Last night I read SKYSCRAPING by Cordelia Jensen. Jensen was the Poet Laureate of Perry County, Pennsylvania in 2006 snd 2007, but this is her first novel. In acknowledgments in the back, Jensen says that the book started as memoir poems, when she was in college, but then evolved into a work of fiction. It's loosely based on Jensen's loss of her father to AIDS, in the early 1990's. 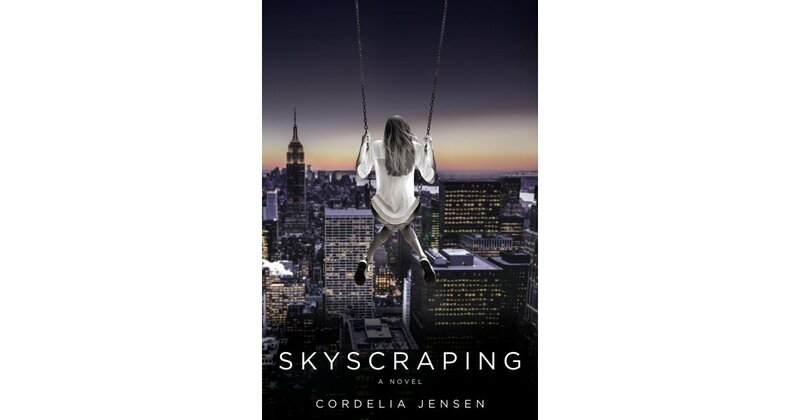 SKYSCRAPING is set in New York City in 1993. Mira, a successful student and editor of the yearbook is just starting her senior year in high school. Her family includes her father, a Spanish literature professor, her sometimes absent artist mother, and a younger sister, April, who is a freshman at the same school. She is a typical on top of the world high school senior, enjoying high school and anticipating college, until she makes a devastating discovery about her family, and then her world falls apart. Mira is taking an astronomy class and Jensen ties the whole book together by drawing on metaphors and images from space metaphors-- the moon, the Milky Way, constellations, the Hubble telescope. Her words are sad and haunting and powerful and hopeful. You can read an interesting interview of how Jensen uses imaging here. Definitely a book for older middle schoolers or high school students or adults. A book about family and loss. It would also be interesting for a study of how authors use repeated images and metaphors.